The long-running legal debate pitting hydroelectric dams against salmon on the Columbia River may finally be coming to an end. As Rob Manning reports, the presiding judge heard a last round of arguments Monday. Hours into Monday's hearing in Portland, lawyers representing the state of Oregon and environmental groups had repeatedly lambasted the federal Columbia River plan. 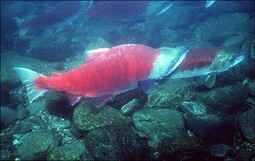 They say the plan sets low standards for salmon recovery. And it won't even reach those standards. Attorneys representing the federal government and the other Northwest states defended the plan, throwing words like "preposterous" and "frustrating" at the other side. Different Northwest tribes argued on each side. Then, about a quarter to noon, there was a pause. The powerful federal judge in the case - James Redden - asked if anyone had anything else to say. The judge said "so, we're good then." He got up, and left the courtroom. At first, attorneys were told to come back after lunch. But moments later, Judge Redden came back in. Environmental attorney Todd True recalls what the judge said next. Todd True: "I think what the court said is 'I've heard from everyone, if anyone has anything more to say - speak up.' No one did. So I think the court has closed the hearing and we'll see what happens next. In the past, Judge Redden hasn't been shy about forcing specific actions - like spilling water - at the federal dams. But now, Judge Redden is expected to finally conclude his decade-long oversight of the Columbia and Snake River system. Steve Wright, with the federal dam operator, Bonneville Power Administration, is eager for Redden's decision on the plan - also called a "biological opinion." Steve Wright: "We are all anxious to move forward and implement the biological opinion - to get the work done." The key question for Judge Redden is how much help the salmon need to avoid jeopardizing their long-term survival. Again, environmental attorney Todd True. Todd True: "The question is, can you save these fish, can you protect these fish, by fixing the habitat, and leaving the hydro system alone? And the answer is 'no'." Barry Thom: "The judge is trying to determine 'is there enough there to avoid jeopardy to the species, and have we done our part to explain that to the judge?'." That's Barry Thom with the federal fisheries' agency at the National Oceanic and Atmospheric Administration. He sees the question -- and the answer -- slightly differently. Barry Thom: "And I think the underlying analysis does show that - from the federal government's perspective - that it is enough, and through the voluminous record that is out there, we're hoping that it comes across, that we do have that basis." Whatever Judge Redden decides could well be appealed. But that would make the complex task of managing dams and salmon another court's problem. Oops! It turns out that handing these out in a federal courthouse is illegal and the bailiff asked me to stop after a complaint was made by an unknown attendee.